Many Washington locations experienced the third warmest September on record this year, and Prosser (WSU IAREC) recorded five consecutive days with temperatures of 90 degrees or higher from September 9th to 13th. The heat wave was the most extensive period of warmth for 2011 and occurred much later in the season than normal. The average temperatures for September were 2.1 to 3.3 degrees above average across Washington. Much of early September featured warm temperatures and cloudless skies under a strong ridge of high pressure aloft. Dry and calm conditions were present for the first half of the month, with no rainfall and low day-time relative humidity. Day-time high temperatures were particularly warm due to warm air aloft and abundant sunshine. However, night-time temperatures were also above normal despite generally clear skies, dry air, and light winds creating favorable radiational cooling conditions. Two distinct cool periods punctuated the latter half of an otherwise balmy September. Following a cool summer, Mt. Vernon (WSU NWREC) was very warm in September. In fact, record warm low temperatures occurred on the 22nd and 23rd of the month. The low of 68.6 degrees on the 23rd was the warmest daily low temperature ever at the station (1994 to present), and is nearly five degrees warmer than the previous all-time record warm low temperature (63.8 degrees on 7-29-09). The low temperature of 62 degrees on the 22nd had broken the previous September record of 61.9 degrees, while the low of 68.6 degrees during the following night smashed the newly established monthly record by 6.6 degrees! The cause of the unusual night-time warmth was the unusually early appearance of the "pineapple express" weather pattern. This weather setup brings warm, moist air from the tropics into the Pacific Northwest, although it normally occurs in the late fall and winter. A warm air mass coupled with cloudy, moist, and windy conditions led to the record warm low temperatures. The average dew point temperature at Mt. Vernon on the 23rd was a sultry 62.3°F. The average daily temperatures of 68.3°F, 73.2°F, and 69.3°F on three consecutive days from Sept 22nd to 24th were all warmer than any previous September day. Most notably, the 73.2°F average temperature on the 23rd was five degrees warmer than the previous warmest September day, and warmer than any previous August day as well! Each of the three days was warmer on average than the typical September daily high temperature (67.9°F). The September daily average high temperature of 82.3°F at Walla Walla was the warmest on record, and five degrees above normal. A large fire near Satus Pass that burned thousands of acres and poor air quality are vivid examples of the regional consequences of unusual heat and nearly two months without rain. The fire engulfed the local Ponderosa Pine forest and destroyed numerous homes and buildings, and required the deployment of more than a thousand fire fighters. It was not until the arrival of rain and cooler weather from a storm system on September 15th that fire conditions markedly improved. Further heat and fire relief came from a second brief round of cool weather associated with another storm system on September 25th and 26th, although the heavy rain remained from the Cascades westward, where coastal AgWeatherNet weather stations recorded one to two inches of rain. Despite the apparent chill of these two main September cool spells, the temperatures during those periods were only slightly below normal. Following abnormal heat for much of the first half of September, a windy and cool front passed through central Washington on the morning of Thursday the 15th and ushered in a pattern change. Along with cooler marine air came clouds and even a bit of rain in far Eastern Washington near Anatone and Pullman. The frontal passage also cleared the air of pollutants and smoke from the Satus Pass area Monastery fire. Day-time temperatures cooled into the 70s for many places through Sunday the 18th. Prosser reached only 64°F on Saturday the 17th due to a cloud cover and cool breezes. Substantial rain fell in parts of Western Washington during the weekend of the 17th/18th with over a half an inch at Montesano on Sunday the 18th. Snow even fell in the mountains above 6500 feet on Saturday morning, September 17th, at locations which had been in the 80s a few days prior. As cool as the weather during that weekend seemed, temperatures overnight during the period were near normal and day time highs were only slightly below normal. In fact, though it felt cool in comparison with the previous few weeks, the coolest high temperature during the period was typical for September, and was not close to record territory. Warm temperatures returned on Monday, September 21st, and persisted until another cold front swept through the region on Sunday, September 25th, bringing rain for Western Washington, clouds for Eastern Washington, and cooler and windy conditions. Monday the 26th was particularly wet in western Washington, with places such as WSU Long Beach and Montesano recording around one and a half inches of rain. 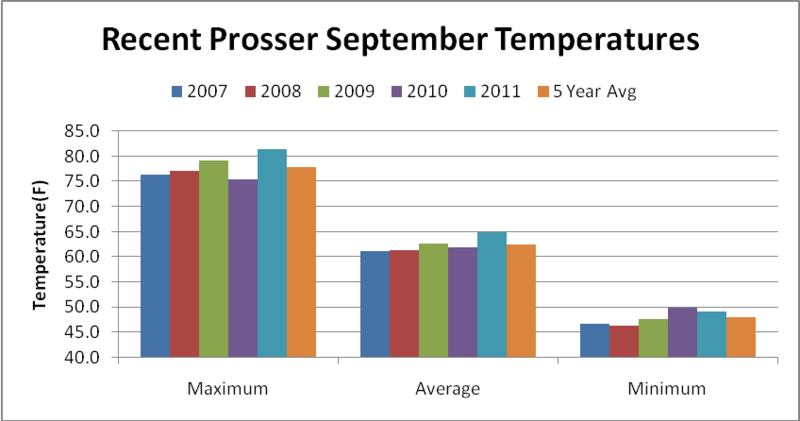 The temperature in Prosser (WSU IAREC) was 2.4 degrees (1.2 standard deviations) above normal in September, with an average temperature of 64.8°F. The average daily high of 81.5°F was 3.2 degrees above the normal September high temperature of 78.2°F, and the average daily low of 49.0°F was 1.3 degrees above the normal September low temperature of 47.7°F. No precipitation fell during the month at Prosser, and the average wind speed was 3.6 mph. The warmest low temperature was 58.1°F on September 9th, and the warmest day was September 12th with an average temperature of 73.9°F. The coolest high temperature of the month was 64°F on the 17th, and the coolest day was the 28th with an average temperature of 53.6°F. The high temperature of 98.8°F on September 9th was the second warmest September temperature ever in Wenatchee. 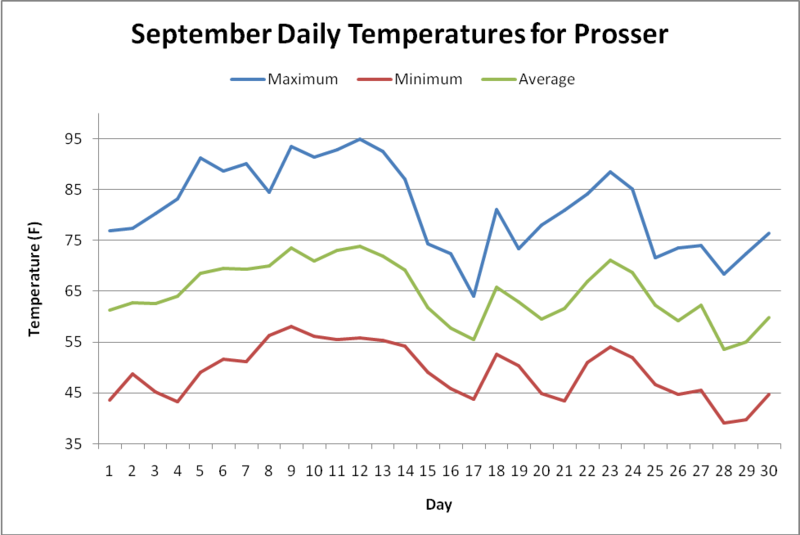 The average temperature of 73.9°F on September 12th was the fourth warmest September day ever in Prosser (WSU IAREC). The high temperature of 97.2°F on September 12th was the third warmest September temperature ever in Moxee. The low temperature of 68.6°F and the overall daily temperature of 79.4°F on September 9th were the third warmest September low and overall daily temperatures since 1989 in Gramling. Orondo reached 100.9°F on September 12th. Washington crops are generally faring well despite the strange weather of the past year. The cold early growing season has left the pear crop 10 days behind schedule and smaller than last year. The 2011 Yakima Valley Pear crop yield estimate is 126,000 tons. Despite recent warmth, apples remain behind schedule by up to two weeks due to the cool spring. The outlook calls for 106 million boxes of apples. The main concern with a late crop is the fear of an autumn frost before total harvest of later varieties like Pink Lady and Fuji. Grapes are running 10 days late, but are catching up due to recent warm weather (Yakima Herald-Republic). The Prosser 5 Year (2006 to 2010) Average Accumulated Growing Degree Days (GDD) for April 1 to September 30 is 2,440 GDD, while the 2011 accumulated GDD is still slightly below normal at 2,200 GDD, although the recent warmth of September has caused the 2011 GDD value to catch up to its value for 2010. However, the forecast for early October suggests a return to cool and wet conditions. Since weak La Niña conditions are redeveloping presently in the equatorial Pacific Ocean, the autumn outlook calls for a slightly higher probability of wetter than normal conditions. * On September 6th, 1998, Prosser (WSU IAREC) recorded its record sixth consecutive September day with a temperature above 90 degrees.